With beautiful homes, rich history, and cute shops (if we say so ourselves), Inman Park is pretty fantastic. But one of the best perks of our neighborhood? The food. With over 14 restaurants and pubs, the dining scene is fabulously diverse. Celebrate the local flavor with Inman Park Restaurant Week, now through Sunday, March 23rd. Not only do our neighbors have delicious food, but there’s certainly some great design to feast your eyes on as well. Right across the street from Nandina, Parish Foods & Goods “serves a variety of regional American inspired dishes with modern twists”. 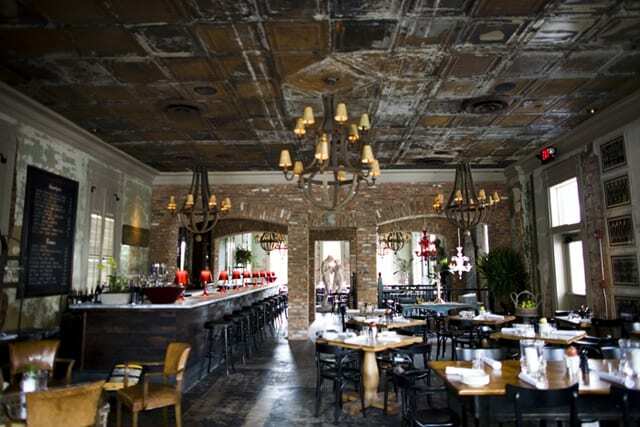 Parish’s exposed brick walls, bentwood chairs, and worn tin ceilings give the space a warm industrial vibe, while the red acrylic bar lamps and large classic statues illustrate the restaurant’s playfulness. In case you missed it, Parish generously provided a scrumptious Derby brunch for our “Lee Loves Local” event last month. Kentucky hot browns, biscuits, fruit salad, and cheese grits were the perfect pairing for our mint juleps. Just a block away, Barcelona Wine Bar offers Spanish-style tapas paired with great wine, of course. The restaurant’s rustic-yet-refined space was designed by the local architects of Square Feet Studio. The oversized artwork serves as a focal point to break up the wood paneling, and the soft drapery balances the roughness. Around the corner on Krog Street, Kevin Rathbun Steak has been named one of the “Best Steakhouses in the United States” by both Travel & Leisure and Details Magazine. Dare we say that the design of the space is as awe-inducing as the famous steaks. The graphic paintings, stained glass windows, and golden branch-like light fixtures are all stunning. Is your mouth watering yet? Stop by and see us on your way to dine with our lovely neighbors and chat with our interior designers about creating a stylish dining space in your own home. Bon Appetit!